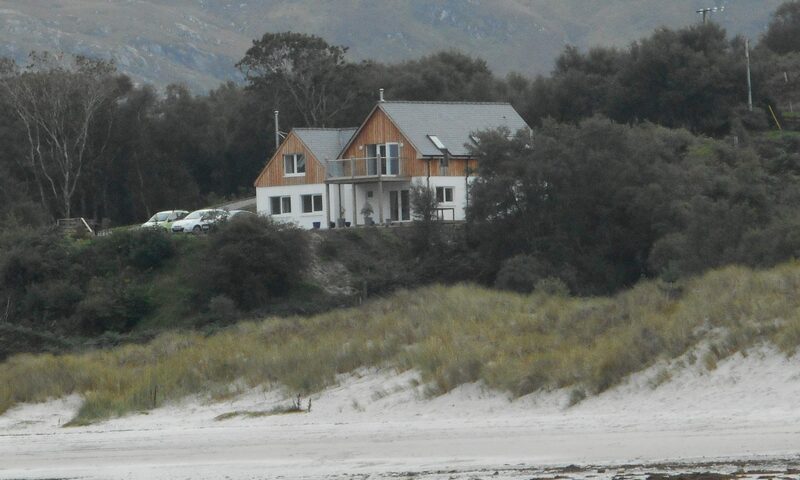 The accommodation sleeps 4/6 and is situated in an elevated position over looking the white sands of Morar. The white sands are less than a five minute walk where you can explore the beach and why not have a picnic? The Accommodation consists of two bedrooms-one on the ground floor with 2 single beds and a smart TV. The second bedroom is on the first floor and is off a mezzanine style and consists of 1 double bed and a snug area with a double sofa bed and TV. There are 2 shower rooms 1 situated on the ground floor and 1 on the first floor. On the ground floor there is a fully fitted kitchen with, an oven, hob, microwave, fridge freezer, washer/drier etc which is open plan into the living and dining area which has a smart TV and a wood burning stove (logs provided at no extra cost). All rooms have spectacular views over the white sands of Morar. Guests have their own decking area and a barbecue. Included: all towels, all bedding, electricity and heating, satellite TV and Wifi. Not Included: food, toiletries and beach towels. Some of the many attractions in the area include: fishing, pony trekking, golf, hill walking, steam train, archery, kayaking and boat trips to the islands from the harbours of Arisaig and Mallaig both only 10 minutes drive. Summer in Sealladh Na Mara :- Wonderful long walks on the white sands- boat trips on the azure sea (whale ans dolphin spotting)- stunning sunsets. Autumn in Sealladh Na Mara:- Golden colours- wonderful quality of light for artists and photography enthusiasts. Winter in Sealladh Na Mara:- Bracing weather- short days- lively walks on the beach- log burner on with a large malt. Spring in Sealladh Na Mara:- comes alive with spring flowers- longer days and beautiful clear views- a bird watchers paradise.